bar coded where appropriate TDS can handle products from retailers, e-tailers, direct mailers, wholesalers and even publishers. 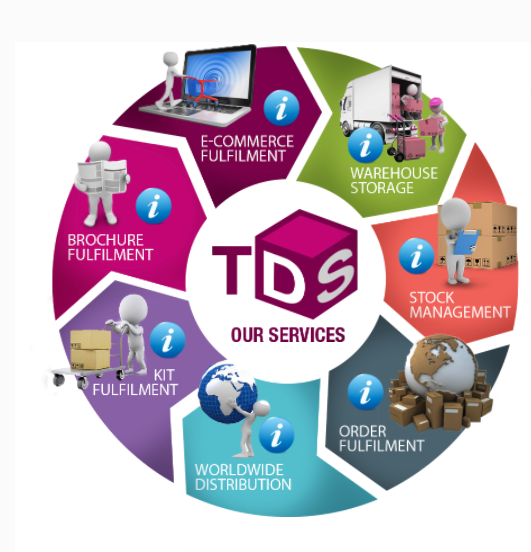 E-Commerce Fulfilment TDS provides complete fulfilment services to many types of e-commerce businesses throughout the world both large and also smaller startups. If you want to get in touch to find out a little more on the range of services we have to offer at TDS, please use our online form to make contact with us or drop us a message on facebook or twitter. How it works! Your customers place their orders on your website, and payment is authorised. We receive notification of orders through web integration or batch file download We print off pick notes and pick the orders from your stock held in our warehouse. We pack the orders using the most appropriate packaging (which we can buy for you at trade prices). We despatch the orders using a range of distribution services (across the UK and internationally). Orders received before 12.00 noon are guaranteed to be despatched that day We handle returned orders, working to your returns procedures. We provide online access to reports so you can keep track of orders. TDS has combined the convenience of our warehouse and fulfilment services with kitting We take pride in the continuity of customer satisfaction and the quality of our work. A strict set of procedures are set into place for each project to ensure the accuracy and efficiency of each kitting job. Nothing leaves our facility without passing our stringent quality control procedures, custom designed to meet the specifications for each job.